The silent priestess is ready for action! "Serena serves the cause with absolute devotion: nothing can stop her anymore." 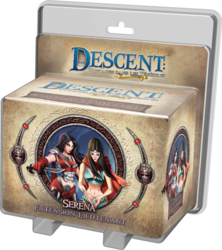 The Lieutenant and Ally Serena miniatures spread temperance and tranquility over your Descent parts: Journey into the Darkness! Serena can also be used as a powerful hero. This expansion also contains the "Silent Protective" Intrigue card deck, along with threat tokens, to give the Evil Lord new options and allow him to recruit the disturbing Serena into a Descent: Dark Journey campaign.